I’m a planner, so are most of my close friends. We have an extensive google calendar sharing operation going on as well as a google group just to communicate plans and misadventures. We often can’t book plans with less than two weeks notice and toggling on all ten of our gcals lights up a screen like the 4th of July. One individual is proposing to ruin all my upcoming plans more than 56 days from now. His name is Harold Camping and he knows when the world is going to end. You might be saying to yourself lots of people claim this and no one pays attention. There was that movie about it, there have been news reports about the Mayan Calendar ending, but the thing here is some people are listening to Mr. Camping. He isn’t a biblical scholar nor does he seem to hold and theological degree but no one seems to mind. 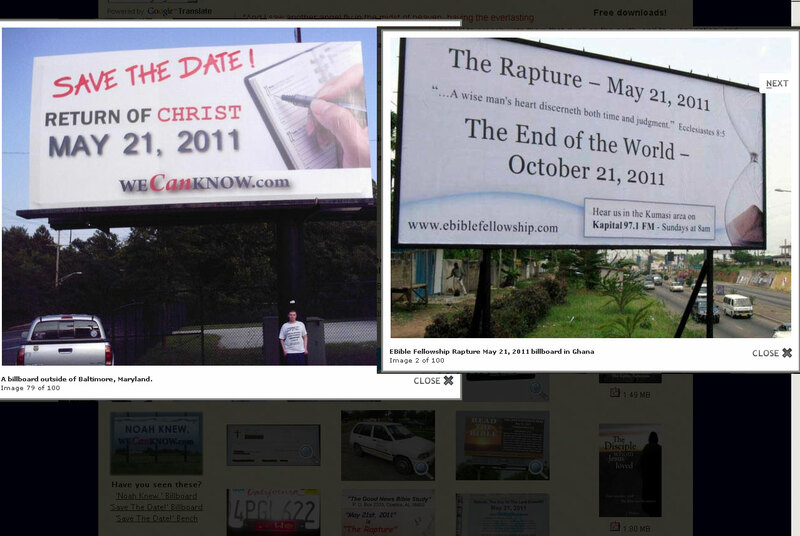 What happens nearer May 21, 2011 when some people think the end is nigh? And what is the PR plan for May 22, 2011? His followers, in turn, are trusting Camping. Allison Warden, a 29-year-old office manager in Raleigh, N.C., runs a website, WeCanKnow.com, dedicated to spreading news of Camping’s predictions. But what if he is wrong? I mean the validity of this claim is easily settled for me, I plan to write my follow up post to this one on May 22, 2011 or if I’m wrong then I will have other things on my mind I’m sure. I think the larger issue here is that people are really unhappy and nervous about the future right now. National and global events have people have had people on edge and there doesn’t seem to be an end in sight — for most of us. I believe this is leading people to want someone with a clearcut answer and you can’t get much more specific than an exact date. One final problem I have is the minor inconsistency of the date in question. If it is clear and knowable by someone reading an English translation of a King James Bible why are there two dates being advertised? I’m going to continue to put things on my calendar until google blacks out all dates from May 22 on, then I will start to worry. But I am excited to start an Apocalypse tag for this blog! Funny post. You are a good writer. I believe in the Bible and it says that not even Jesus or the angles know when the end it coming. I don’t want to start an argument, just wanted to share in the ridiculousness of predicting the end. Thank you for your comment, no fight necessary. I have many friends who believe in what the Bible has to say to varying degrees, this post was much more about the absurdity of this leader and the sad state of affairs that are garnering him followers not meant to be an attack on Christians in general. Love having a dialog!